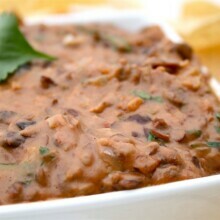 This is a warm and spicy Black Bean Dip Recipe! Made with spices, black beans, salsa, and cream this dip is perfect with chips! Preheat large skillet over medium heat. Melt butter. Saute onions and garlic together for 3 minutes or until softened and slightly browned. Stir in black beans, salt, pepper, cumin, and chili powder and cook another 5 minutes or so over medium-low heat. Stir in salsa, cheese, and cream. Using a potato masher, mash beans until desired consistency is reached. Stir in cilantro. Spoon into a bowl and serve warm with tortilla chips.